The Method feeder is a deadly stillwater tactic for carp, bream and tench, but loading the feeder the traditional way can be a lengthy process, that's where a Method feeder mould really comes in handy. This clever device creates a perfect Method ball almost instantly, saving you vital minutes which can be spent catching more fish. Here we explain how it works and suggest several ways to get the most from your simple yet effective Method feeder mould. One point that ought to be mentioned immediately is the fact that Method feeder moulds can be used to compress either groundbait or pellets around a frame feeder. Some prefer to use simple groundbait, while the more inventive and creative anglers among you might like to use pellets. Afetr all pellets presented on a feeder has been THE best tactic to use recently. And what species might you typically catch when using a Method feeder? Well it'll be carp, bream and tench most likely - bottom feeders mainly. But of those three species, carp are the likely candidates to be attracted to the scent of the groundbait or pellets, respond and swim over to take your bait. them with water (lake water is fine, but tapwater will do). Leave the pellets to stand for around an hour to soak up the water. They should be reasonably soft after this and you should be able to squeeze a handful into a ball that holds together. Pellets of this texture are perfect for moulding around the Method feeder. Band a 6mm or 8mm hard pellet and place the baited hook centrally into the bottom of your empty Method mould. Fill the Method mould to the brim with the soaked 2mm pellets. Your hair-rigged hookbait should be buried beneath the pile of bait. Take the Method feeder and gently press it into the mould. This will help the 2mm pellets and your hookbait take on the exact form of the mould every time. The feeder should look like this once out of the mould. Note the hookbait on top of the pile of bait, highly visible to fish and leading to more bites and bigger bags! Groundbait can also be used with your Method feeder and mould. Specialist groundbaits for Method feederfishing are available, and these should be mixed reasonably wet but not sloppy. It is then a simple matter of following steps 3 to 5 above to help create a neat ball, again with the hookbait fully visible. A flat Method feeder is best when feeder fishing close to islands. These usually have a small shelf or slope that the fish patrol. An oval Method ball could easily roll down the slope or off the shelf away from the fish, but a flat Method feeder will stay in the targeted area where they are on the hunt for food. Experiment with the colour of your groundbait or pellets. Try a bright mix or dyed pellets. Dynamite Baits Spicy Tuna and Sweet Chilli benefit from flavour and colour additives that fish will find irresistible! Always use a very short hooklink of between three and four inches. This will allow the fish to slurp the bait up without feeling any instant resistance. Once it does feel the weight of the rig it is too late because the hook will already have taken hold in its mouth. Don’t be afraid to feed via a catapult over your target area. This will add extra bait to the swim and also create a splash which the fish will be attracted to. Feeding large pouchfuls infrequently will help keep the fish on the bottom. Recast your feeder at least every five minutes. If you are not getting bites, this is a great way of building a big bed of bait up in your swim. Once the fish turn up, they will have plenty of loose offerings to feast upon and this should keep them in your swim for a long time. Use the line clip on your reel to achieve consistent distance. At the start of the session, cast to your target area. If you land a few metres short, peel the necessary amount of line off the spool and clip-up. Keep recasting, peeling more line off and clipping-up until you are tight to the fish-holding feature. Your hooklength will be put under a lot of pressure when using the Method and must be strong enough to deal with these rigours. When fishing for carp up to 5lb use 0.18mm or 0.22m for fish that run into double figures. Your hook size will depend on what bait you are using. Use a size 14 for an 8mm pellet or small white boilie, and a size 16 for maggot or corn. Use a hookbait that stands out significantly from your groundbait or pellets. Carp are likely to snap up what they set their eyes on first, and a small white boilie is a great choice. Stand-out alternatives include corn and red meat. Be aware of venue rules. Both in-line and elasticated Method feeders are readily available in all tackle shops but some waters restrict the use of the elasticated versions. Inline Method feeders are permitted at virtually all commercial waters in the UK. Groundbait is the perfect attractor for most fish. A carefully placed ball or two of the right groundbait can increase the chance of fish being attracted and drawn straight to your hookbait tenfold. Years ago groundbait consisted of simply breadcrumbs. Now the fish have never had it so good, with all manner of fantastic ingredients used in the formulation of groundbait to add different scents to the water, and to create different reactions on the bottom too. It’s a real minefield out there when it comes to picking the right groundbait as there are so many available, but here we will help you choose the right one for you to enable you to head to the tackle shop in confidence, sure that you will be picking the correct mix to attract the species you wish to catch. In the main groundbait is sold in 2.5kg bags for around £2.75. The vast majority need to be mixed carefully with water. Doing this ensures all the crumbs are dampened, the groundbait sticks together, it doesn’t float, it can be formed into balls, it becomes sticky, it becomes capable of holding other food items like casters, and that is can be thrown into the swim. There are now four main colours of groundbait: brown, black, red and green. The vast majority of groundbaits out there are brown, and this colour is by far the most popular if you want to attract all species of fish because it blends in with the bottom of the venue, therefore it won’t scare the fish too much. There are a few groundbaits that are black. These tend to be really finely ground mixes that are best used in the height of winter, when the waters tend to be crystal clear. A black groundbait provides a very dark carpet on the bottom, and if they are mixed quite dry, they will also form a dark cloud near to the bottom too. This dark colouration gives smaller fish, that would otherwise be spotted by pike and zander, the confidence to come into the cloud and feed over the black carpet of feed on the bottom. Red groundbaits are few and far between. The most commonly known red mix is Van den Eynde Expo. This is a renown tench groundbait, but it also attracts bream and carp too. Tench respond well to red groundbaits, but most other fish don’t care much for this colour. Green groundbait is a relative newcomer to the fishing market and has come about through various ingredients used to catch and tempt carp. They tend to be fishmeal based groundbaits and therefore a green mix will attract bigger fish, such as carp, tench and bream. The list here is vast, but it really isn’t worth naming all the ingredients as you are very unlikely to know what is in each mix because that information is never printed on the bag – it’s a widely kept secret in most cases. But, there are a few ingredients that may well be listed and, if you look closely, you can actually see them among the crumbs. Fishmeal is a prime ingredient in many carp and bream groundbaits. It is simply dried and ground fish offal. When used in a groundbait it is extremely fine and powdery, it mixes very easily and releases a great deal of scent. What a fishmeal groundbait lacks is activity. What we mean by this is a ‘fizzing’ action on the bottom. Fishmeal groundbaits simply sit there in a pile, slowly breaking down to release scent. For this reason, a fishmeal groundbait is by far the best type of groundbait to use for bottom feeding fish such as bream. The inactivity of the groundbait on the bottom will ensure that the fish remain on the bottom, right where your hookbait will be. Other ingredients, such as crushed hemp, have completely the opposite effect of fishmeal. Crushed hemp makes a groundbait very active indeed. Once the balls of crushed hemp-laced begin breaking down they will release those particles of crushed hemp which rise from the groundbait a little, then drop down again. One ball of ‘hemp’ groundbait can take half-an-hour until all the particles cease their activity. Roach, rudd, barbel and chub love this type of groundbait, where there’s masses of activity on the bottom. Bream, skimmer bream, tench and carp aren’t particularly fond of it. Other ingredients, such as crushed nuts and molasses help bind the groundbait together. When mixed with water these ingredients make the groundbait quite sticky, therefore excellent for fishing really deep water or powerful rivers, where the angler requires the groundbait to sink straight to the bottom before it begins to release any particles and loosefeed contained within the groundbait balls. Breadcrumb is another widely used groundbait ingredient. Although carp, bream, tench and roach all love breadcrumbs, by the time it’s used in a groundbait mix the crumbs will be overpowered by the additional scents and particles added, so in the main bread crumbs are simply used as a bulking agent in most groundbaits. The exception is pure white bread crumbs itself. Although perhaps the simplest of all groundbaits, this is one of the most specialist mixes that really plays a key role in winter, for roach and skimmer bream fishing. Biscuits, crushed seeds, salt, spices and vegetable matter can also be contained within groundbait. These are simply used to provide additional scent, attractors or simply as a bulk. The key to a perfectly mixed groundbait is a little time and effort. 15 minutes spent doing this correctly at the start of your session will make all the difference to your catch. So, get it right and you’ll definitely put more fish in your net. All you need is the groundbait (obviously! ), a round groundbait mixing bowl and a spare bait box. There’s no need for any additives or colourings – the mixed groundbait will be more than enough to attract fish into your swim. A groundbait riddle will help ensure that you have the right consistency, but this is not crucial. Pour the groundbait into your mixing bowl. A full 2.5lg bag will be enough for a full day’s feeder fishing session, but you may need twice that if you know that the fish respond to regular feeding with small nuggets of groundbait, or you are fishing the Method for a full day. Now form a small dip in the centre of the groundbait, scoop up some water into a spare bait box and add a little to the groundbait. Mix it in thoroughly using your fingers. You need to keep mixing and adding a little water until the groundbait becomes fully damp throughout. The perfect groundbait should be fluffy and just sticky enough to hold together with a single squeeze. If it doesn’t hold together with a single squeeze, add a touch more water and mix again. If it’s one solid ball you have added too much water and that groundbait will have become useless – it will need throwing away and another batch mixing. There are two key ways we can use groundbait to draw fish into our swims. The first is to squeeze it into balls and throw it in, the second is to put it inside or around a feeder and cast it in. Both are excellent ways and both have their day on certain venues. The downside with forming balls of groundbait and throwing it in is that you cannot take out what you have put in to the water, so if the fish aren’t prepared to respond to a heavy bombardment of groundbait you will have problems! So, of the two methods, introducing groundbait via a feeder is often the better option as you are only introducing a little at a time. Around 15-20 casts with a groundbait feeder will be equivalent to one large ball of groundbait going into the water. This is the term used to describe making a multitude of groundbait and throwing it into the swim at the start of the session and throughout it when required. The balls are formed by hand, using both hands, to make them perfectly rounded and therefore aerodynamic. And the best way to do this is to make the required amount of balls first, then cast your float out or ship your pole out and use it as a target to aim your groundbait at. Don’t throw the groundbait out like you would a ball as it will simply break up mid-flight. You need to throw them out using an underarm swing, and let the balls roll off the palm of your hand. When balling in it’s important, if you are adding loosefeed, not to add anything live, like maggots. Their wriggling within the groundbait balls will weaken them and they are very likely to break up in mid-flight, scattering the feed all over the place. These balls of groundbait can also be cupped in via a pole cup, which is by far the most accurate way of feeding groundbait. The groundbait balls will weigh a substantial amount though, so be very careful that you do not damage or snap your pole while you are shipping them out. This method of introducing groundbait can be much more accurate than balling in, plus it can be used to introduce groundbait at a much further distance than throwing it or catapulting it. Another plus point with feeder fishing is that every time you cast your feeder you are introducing another small patch of groundbait very close to your hook, and if you keep casting to exactly the same spot time after time you will slowly but surely build up the attractors and therefore shoal the fish together. The groundbait for feeder fishing should be mixed in exactly the same way as before, so that it just holds together with a single squeeze. Use your feeder to scoop up the groundbait and lightly squeeze both ends of the mix so that it compresses slightly within the feeder. Don’t squeeze too hard or it won’t explode from the feeder. Once you’ve cast the feeder out, water will penetrate the crumbs, making them expand even further until they almost explode from the feeder. It is possible to add extra loosefeed to the groundbait when feeder fishing. Simply add just enough for the next cast to the groundbait, scoop it into the feeder and cast it out. This type of feeder fishing works with absolutely any type of groundbait mix – so long as it’s mixed correctly. Method feeder fishing is a little different. The groundbait needs to be the right type of it won’t work. The best mixes are either specific Method groundbaits (it will say on the bag) or any fishmeal carp groundbait – they are both as effective. Method feeders aren’t tubular like groundbait feeders – they are more like a spiral or rib-cage design. This is because the groundbait should be stuck to the outside of the feeder, so that the fish can peck and attack it. 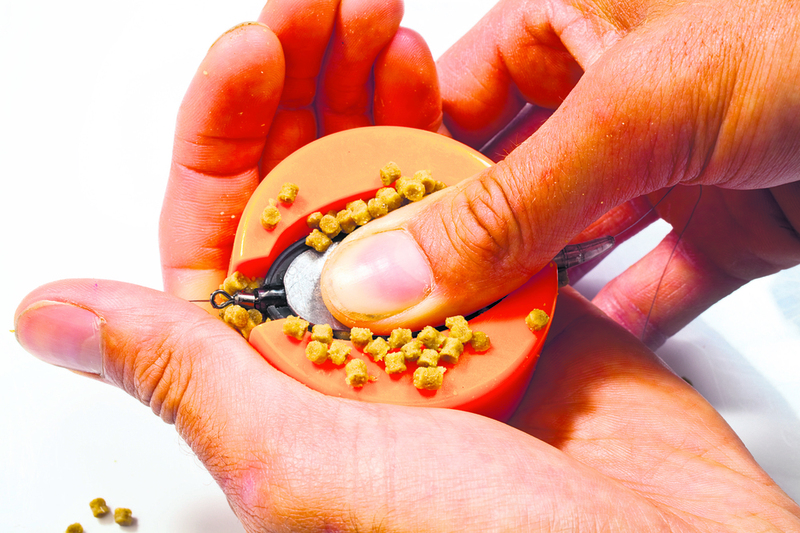 The Groundbait needs to be moulded around the Method feeder’s frame by placing a pile of groundbait into the palm of your hand and pressing the feeder into it. A few gently squeezes in the right place will ensure that the groundbait remains aerodynamic and easy to cast. Once on the bottom the fishmeal-based Method groundbait will remain around the frame feeder, in a prime position for the fish to find it, and find your hookbait (which should be set upon a very short hooklength), and take it, and then hook themselves against the weight of the feeder.